Tapering of quantitative easing (QE) in the United States had less effect on Russia than on other developing countries, Russian Finance Minister Anton Siluanov told a meeting with foreign investors in Hong Kong on February 20. “As compared to other emerging markets, Russia is in a somewhat different situation. 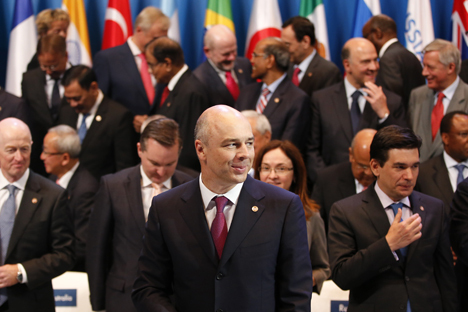 It was BRICS that proved the most affected by consequences of QE3 wind-up,” said the minister. But “given its positive balance of payments and an almost balanced budget, Russia did not feel the impact” of these changes to such an extent as other BRICS countries, he said, referring to the assembly of Brazil, Russia, India, China and South Africa. Since January 2012, other BRICS countries’ national currencies had lost an average of 20 percent whereas the rouble dropped only 10 percent, Siluanov said. “While a year before, we thought emerging markets would be a driver of economic growth, now we are, unfortunately, witnessing a slowdown there. On the contrary, we are observing acceleration in the U.S., stabilisation of positive dynamics in Europe and other mature markets,” Siluanov said. This needed new growth models, seeking new sources of growth and structural reforms. Noting poor economic growth in Russia, Siluanov said it mirrored reduced global advance and that slack demand among Russia’s large exporters had reverberated across the nation. Domestic factors in deceleration had been principally lower growth in domestic demand, primarily investment demand which, the minister said, was not a specifically Russian trend. This was due to a poor investment climate and a downturn in the activities of major natural monopolies. Private investments showed decent growth of about 8 percent last year whereas investment by natural monopolies such as Gazprom slipped as the investment cycle closed. But foreign investors were not fleeing the Russian market, the minister said. “Foreign investors make up about a third of our internal debt holders,” he noted, pledging the utmost to provide a comfortable investment climate. Central Bank of Russia (CBR) figures for early 2014 show that non-residents accounted for 23.9 percent of the Russian sovereign, or OFZ, market, against 19.9 percent a year ago. These holdings totalled 894 billion roubles ($1=35.778 roubles) at January 1, 2014 compared with 911 billion roubles in 2013. Tapering of QE in a monthly amount of $10 billion was announced last December by the then governor of the Federal Reserve System Ben Bernanke. As a result, by February 2014 the asset buy-back fell from $85 billion to $65 billion.